Weekend Wrap: Ruark R7, Pro-Ject Stream Box, JBL headphones, Linn deals and more | What Hi-Fi? Pro-Ject has announced that all of its Stream Box models will now be compatible with Spotify Connect, thanks to a firmware update. The update means Spotify Premium subscribers will be able to user their mobile, tablet or computer to control playback from the Stream Box. Music will also remain uninterrupted when making calls or if you go out of range - Spotify Connect streams your music from Spotify's cloud servers directly from the device, not via your phone. 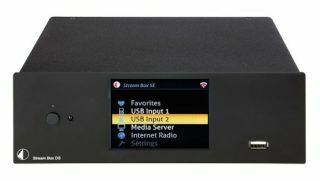 The firmware update will also allow the Stream Box models to locate and stream lossless and compressed audio from DLNA-compatible media servers and PCs. Users can update their Stream Box by going to Settings > General > Software Update. Ruark has introduced two new finish options for its R7 radiogram music system. The new finishes are soft black and white, and join the current real walnut veneer. The R7 is inspired by 1960s design and supports aptX Bluetooth and DLNA streaming, built-in wi-fi, DAB, FM and Internet radio and CD playback. It uses a 2.1-channel design, with 5.5in dual concentric drivers and 8in long throw subwoofer. The Ruark R7 is available now in the new colour options for £2000. European authorities have agreed to scrap mobile roaming charges from June 2017, meaning you’ll pay the same amount to use your mobile in Europe as you would in the UK. Current changes stand at €0.19 per minute for calls, €0.06 per text message and €0.20 per megabyte of data. These will be reduced on 30th April 2016 to €0.05, €0.02 and €0.05 respectively, before being completely abolished a year later. However, the telecoms companies will be able to issue a “fair use policy” to prevent people abusing the use of roaming services. The Reflect Mini in-ear headphones are JBL’s smallest and lightest sports in-ears and succeed the previous Reflect Sport headphones. The Reflect Mini are sweat-proof, feature “highly reflective” cables for improved night time visibility and deliver “JBL Signature Sound” through 5.8mm drivers. They come with two types of ear tips: sport and regular, meaning they can double up as a regular pair of in-ears. They’re available from July in red, blue, green and black, for £50. Linn will be offering customers 25 per cent off selected titles each day on the Linn Records store. Titles will be a mix of vinyl, new releases and new Studio Master downloads and the 25 percent discount will already be applied. You can view and buy the available titles from the Linn Records store. TVPlayer has added a pay TV option to its existing offering of 55 free-to-air TV channels. The live streaming TV app, which is available on Android, iOS, Amazon Fire TV, Mac and PC, now has a TVPlayer Plus option for £4.99 per month. This gives you 25+ premium channels, including Discovery, History, British Eurosport and British Eurosport 2, National Geographic, Nat Geo Wild and more. The app focuses on live TV but also offers around 100 hours of catch-up content anywhere you have a cellular or WiFi connection. You can use TVPlayer for free and existing users can register for a one-month trial of the new pay TV service, which is set to launch later this year. See the TVPlayer Plus website for more details. Sony has created a neat video to show-off its MHC-V7D speaker, which uses Cymatics to show "the visual representation of sound". The video uses water, sand, paint and even vodka to show how the drivers of the speaker move as the music plays. And it's a neat effect.